@Dr.Colossus Thanx for the shading. haven't though about that. I am also a bit worried about the light green leaves in general. they don't seem to fit the rest of the colour theme. I've tweaked around with some darker colours but not to my liking. some dittering might be an idea. [...] Re that hut: Outline those leaves in black or dark grey instead of dark green, add some dark green shading to the existing light green, maybe throw in some brown or grey behind the leaves. The Keen 4 Demo Background-Tileset features these tiles over here. But they are a bit dark, aren't they? maybe planed for an inside of the hut kind of view?! and here is the Romero orig. any further ideas are very welcome! and replace https://www.dropbox.com with https://dl.dropboxusercontent.com. Last edited by Nisaba on Thu Oct 18, 2018 20:52, edited 1 time in total. For some reason, the browser version is not working. It's showing only "Downloading..." and stays that way. thanx. If you don't mind I'd like to borrow the stunned stars from your recent project. You can in fact design a K4 level right away and send over the aslev file. I need to convert some tileset and old but freshly recovered level stuff anyways. At the moment I think I'm better with tiles than with sprites, but I could still use practice with both. When I do start to contribute you might want to keep in mind, I'm a perfectionist so any graphics I do may take a lot longer than they probably should. ok mr perfectionist, you are very welcome to contribute some graphics in April. just let me know and I'll send you the egg-salad-recipe. I like the design and the music, and don't think the music feels out of place like others have suggested. And yeah, as Zilem mentioned, that dancing larva is super-lovely. I'm not sure if it was latency caused by browser-based DOSBox, me being generally garg at games, or an actual issue, but the number of times I was killed by a nasty jumping at me from outside the screen was embarrassingly high. Also, I made the mistake of following an arc of bottles and landed in spikes - I guess this is a mod for pixel-perfect players? Which is fair enough, it's just pretty unforgiving. Do you like to see more little extras like the larva? the blue guy - let's call him Lick - will show a different behavior in the main release! for this demo, it is just a simple replacement. Concering those point items: they are meant to lead you the way. but if they give you a hard time, you might want to beta test this mod later on, so I can fix issues like this. thanks for pointing that out! A bunch of further levels are in the making. Great Demo! And I love that you actually used the demo features in the game for demo messages, great touch! Playing this reminds me how much I want to get back to my own Keen work! For the most part, I felt this was a great medley of familiar graphics from Keen 4 and Dreams, a few from Keen 6 and some all new material. 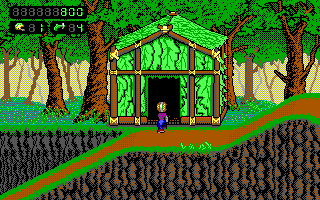 I particularly like the wooden log buildings and all the graphics that integrate them into the world. The biggest drawbacks, I feel, are the point items and the world map graphics for the apple orchard and spud city (hoping these are placeholders?). I think the level design is good; I played on normal and...died more than I should have, I think I'm just rusty though I always felt like I knew where to go though. I also wanted to recognize and appreciate the 'logical' use of the doors; I think doors are the most disorienting feature in Keen games and the use of them in this level made sense. The world map design, on the other hand, feels crammed and linear. Is this a placeholder to showoff graphics? I agree with Roobar's assessment of the music too; the world map is a great rendition of the classic, but the BwB level feels off, and the outpost level song, while good, doesn't feel like it fits the setting (it feels more keen 6 to me). Re that hut: Outline those leaves in black or dark grey instead of dark green, add some dark green shading to the existing light green, maybe throw in some brown or grey behind the leaves. The great Ceilick. I need to thank you for your modding tutorial on the Keen Wiki. without it, I wouldn't be doing what I'm doing! And I love to hear that I could actually "push" you and your modding plans. Sign of the Vool is personally my number one most sought-after mod. So be warned, you better protect your files cause I might wanna take them over. please tell me more about the point items. constructive criticism is always very much appreciated. what are your recommendations? please share your modding knowledge! but the world map is indeed more like placeholder. remember: this demo is really just a taste of what's to come. so there are a lot of placeholders. nevertheless I'd like to know what's your concern about the apple orchard and spud city? I agree with your assessment of the music too, but I'd love to keep all of these tracks. But not in the way they are presented. The BwB song needs to be remixed. It is a ripoff from the Keen 4 Demo version. K1n9_Duk3 exctrated them for me (thanx again!). There is also an Oasis track which needs some tweaking. but unfortunately I have no experience when it comes to composing midis & imfs. So I'm looking for someone competent (next to Mr M) who could contribute one remix or two. Or someone who can point out some useful tools. @Roobar @Ceilick: I've just updated the download link. The Outpost now features a new track, freshly recovered by Mr. M. let me know what you think! btw. : have you discovered the teddy bears? every level (well only two by now) feature one hidden teddy... just saying. I like the tweak Dr. Colossus did to the wood work. So i made this quick yesterday, which makes each leaves standout from one another. But it still looks like the leaves could use some shading, and the center area of the leave be black or dark gray, and then use the dark green to shade the leaves. And I love to hear that I could actually "push" you and your modding plans. I think that's what a lot of us who have worked with those tiles believe. If you haven't checked out Netkeen for Keen 4, some of those levels feature these tiles. Re the Hut: Zilem's example is exactly the direction to go in my opinion. The outlined leaves really bring the house 'forward' in perspective. If you prefer a more subdued presence, perhaps exchanging some of the black outlines for dark grey, or a mix of both. 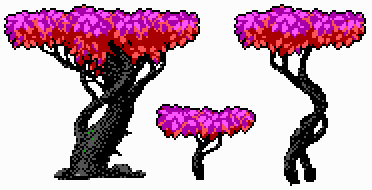 Additionally, I would suggest shading the spine of the leaves with some black or dark grey, and perhaps more dark green dithering (more on the left side than the right). 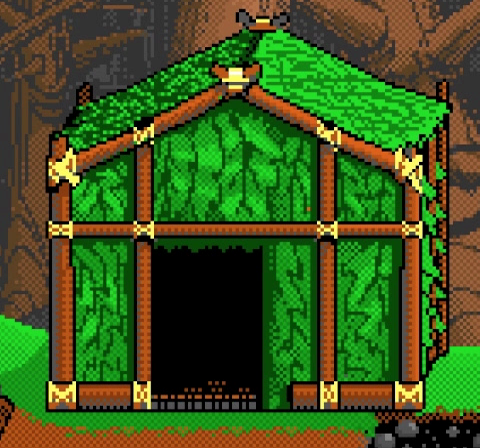 Additionally, I think it would help make the hut look more natural if some of the leaves overlap the wooden poles. I'll comment on music when I get a chance to play again, and maybe draw up some helpful examples for the hut, points, and level entrances. Well, I see picked up this project instead of me, which absolutely no problem, because you refreshed the mod itself better that I wanted to (at that time when I wanted to pick it up concretely, if you get what I mean). I mean you have put in tiles that are better than my ideas. That's how I mean. Also are contributions allowed in FiF, Nisaba? some updates I like to share and discuss with you. I'm working on different tree ideas, which i like to include. here is a sneak peek. I'm very curious about your opinion. constructive criticism is very welcome. for e.g. should I reduce the dithering? do you think I need to add a black outline like seen on the right hand side? Last edited by Nisaba on Thu Oct 18, 2018 20:52, edited 5 times in total. The style reminds me of acacia. I think it`s quite nice. We have to wait for your other ideas. Looks good to me! Its gonna be something new, well... at least I have never seen trees like that in any keen mod before. And I love new stuff in Keen Mods. Yeah, those trees look great! I would apply the black outline to them if Keen can stand on them. For consistency's sake, the outline should usually tell that you're looking at a solid object that Keen can interact with. They're really good. I tend to think like Grimson; if it's walkable on, then black outline. There are exceptions. The grass is of course standonable (What?) but very dithered. I added some black pixels to the top to slightly separate it from the background, but it's meant to blend more than stick out. If your trees are to blend into a background leaf pattern then leaving the leaves unoutlined (Wait what?) might be best.